This radiant 1,447 SF, split 2-bedroom, 2.5 bathroom residence features west views, 10' ceilings, and 6-inch-wide white oak plank floors throughout. The gracious open concept living and kitchen space embraces the west exposure and is adjoined by a separate dining area perfect for entertaining. The kitchen offers a rich mix of materials and textures with custom designed solid fluted white oak cabinets, Balsatina lavastone countertops, and Zucchetti fixtures. Fully integrated, state-of-the-art Miele appliances include a 30? four-burner gas cooktop, 24? microwave/ speed oven, refrigerator, freezer, dishwasher, and wine cooler.The west facing master bedroom suite offers a spacious walk-in closet and an en-suite five-fixture master bath that features an elongated custom white oak vanity with integrated double sinks, a Muse by Kos deep soaking tub, a separate oversized shower and private water closet. A second bedroom offers western views and an en-suite bathroom with Calacatta Caldia marble slab walls and flooring, shower, and custom designed white oak vanities with Zuchetti countertops. 565 Broome Soho is designed by award winning architect, Renzo Piano. Backed by his team at Renzo Piano Building Workshop, he recently designed The Whitney Museum of American Art in New York City in addition to designing many of the world's most recognized and celebrated properties. 565 Broome Soho will be Renzo Piano's first residential building in New York City. Our location in highly sought after Soho mixes the best of restaurants, high end luxury retailers and neighborhood services that are part of day to day life. 565 Broome Soho is in very close proximity to Hudson River Park with many recreational opportunities including biking and jogging paths and playgrounds. Renzo Piano has created a 30 story building with 115 residences, the building standing 290 feet makes it the tallest residential building in Soho. The façade, curtain wall, is comprised of low iron extra wide glass which is almost like crystal and allows for optimal clarity. There are no harsh corners in the design of 565 Broome Soho - the corners are rounded using non-segmented glass which can give the resident the feeling of floating over Manhattan.Amenities include a spacious lobby designed by Renzo Piano with a 24-hour concierge and attended lobby with double height glass that allows for plenty of natural light. Other amenities include a private gated driveway and a porte cochere that is beautifully planted and landscaped, a 55-foot indoor swimming pool on the 9th floor with men's and women's sauna and steam. Off of the 9th floor the building has a 1200 SF landscaped sunning terrace. 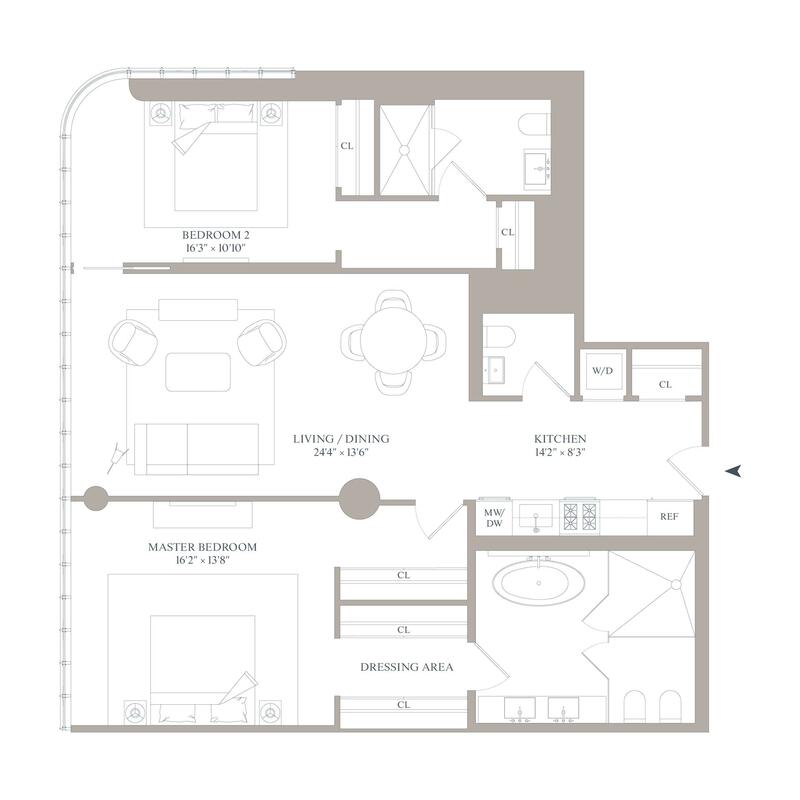 On the 7th floor there is a fitness center, yoga/stretching room and a children's playroom. A stunning conservatory/curated library for residents only has 92' ceilings, a live wall with growth lighting as well as ambient lighting plus a social room, media room and a caterer's kitchen. The building also has automated parking for purchase.